The great liberal Biblical Scholar James McGrath just wrote a nice post about this troubling question. 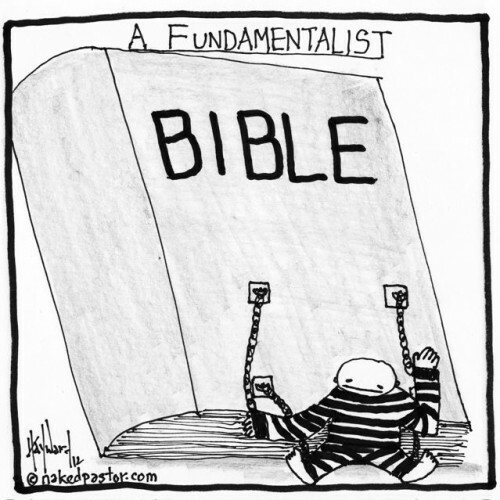 David Hayward’s cartoon above illustrates the reason why I consider Biblical literalism to be an attack on Christianity, rather than an expression of faithfulness to it. No matter how much they insist otherwise, no one actually takes the Bible literally – not even all the bits that are “clearly” non-poetic. But that doesn’t stop preachers from telling people they have a stark choice: either accept everything the Bible says, or toss the entire thing aside along with any faith, beliefs, and values they associate with it. If that were indeed the choice that confronts us, then there would be no alternative to walking away, other than increasingly feigning faithfulness and consistency while hiding one’s hypocrisy. Both options are detrimental to a healthy spiritual life. But they aren’t the only options. Christianity flourished before it had a Bible, and when the collections of texts that Christians had could not be read by most of them. And even among those who could study and interpret the texts in question, what we see them doing with those texts is anything but literalism. It is time to make clear to the world that the situation is not one of faithful Biblical literalists and then others who are compromising “sort of” Christians. If anything, the situation is one of progressives who are seeking to continue the dynamic interplay between tradition and novelty to which the Bible and the entire history of religion (not just Christianity) bears witness, and people who deceive the gullible into first believing, and then pretending, that they are being faithful in ways that they aren’t, at least not consistently. But the above two options are not the only ones. There is an enormous range of others in between them and beyond them. While there are choices we sometimes need to make between two options, rarely are those two options the only ones. Despite what fundamentalist preachers will tell you. You can read my response just below. I am convinced that fundamentalism (and more generally Conservative Evangelicalism) are destroying Christianity by leaving us no other choice than sacrificing our intellectual honesty or giving up our faith in Jesus altogether. I started blogging in order to contribute to show that this is a false dichotomy , that one can be an enlightened religious believer hoping in the God revealed in Jesus of Nazareth. Conservative Evangelicals (CE) keep saying that progressive Christians pick and choose from the Bible in an irrational manner. But as I have (hopefully) made it clear, THEY are the very ones who are guilty of this inconsistency. There is nothing wrong about selectively approving good parts of a book you don’t view as inerrant, everyone (atheists, deists, pantheitst, Marxists…) do that all the time. – which texts they necessarily have to distort because they contradict the former ones. And they delude themselves into thinking that extraordinarily implausible harmonizations are acceptable if they are just logically possible. I don’t hate or despise Conservative Evangelicals but think it is my duty to strongly oppose their positions, because they are really destroying our faith and are building a house of cards which is all too ready to collapse. It is certainly no coincidence that a great number of militant atheist in America are former fundies who have never given up their bigoted mindset. They have kept (to an important extent) the habit of thinking of the Bible as having ONLY ONE VOICE on moral issues, as the following dialogue with an anti-theist illustrates. – pointing out that the central message of Jesus was progressive . ← Weisen die Fortschritte der Naturwissenschaft auf die Wahrheit des Naturalismus hin? Lotharson, you’re doing it again! Would you please go read your own link that fails to justify your factually wrong statement the large majority of militant atheist (sic) in America are former fundies who have never given up their bigoted mindset. If you do read the paper you link to, you’ll find the link is between one organized skeptic club (in Philadelphia) and a highly negative religious upbringing. (I cannot find a single believer OR a single atheist who has not been adversely affected in some way by religious privilege.) You – not the paper – conflate these skeptics with ‘militant’ atheists. Demonstrate that link. As far as I can tell, you have zero evidence to justify this claim. In addition, you extend your mistaken assumption – for that is ALL I think it is – and claim that from this paper you are enabled to magically reflect that the majority of ‘militant’ atheists equivalently have the same background. Again, you offer not a shred, dot, spot, or speck of evidence to substantiate your highly negative claim except by this paper that contains no such data. And this matters, Marc, if you’re concerned about what’s true. Yet you keep this false claim alive again and again and keep slipping it into posts as if it is true when I keep asking you very nicely to stop doing this because it’s not. It is a maligning of people based on a group affiliation, namely New Atheists. That’s bigotry in action! Prove that my request is misguided. Demonstrate it. Show us how you arrived at this ‘majority’ figure, please. And then demonstrate how these negative religious experiences turn former believers not just into New Atheists but into anti-theists, please. If you can’t do that – and I know perfectly well you can’t because it does not reflect the vast majority of atheists I know who speak out publicly against privileging religious belief in the public domain – then stop pretending that your imagination is compelling evidence to justify this intentional maligning of these atheists as if they and not you were the bigot! My experience tells me they not. They are critics of religious privilege with all kinds of well justified reasons for their opinions. Bigotry and criticism, however, are not synonyms, Lotharson. And – unless you can show differently – lying about this supposed evidence repeatedly in order to vilify critics of religious privilege is not justified by a misguided sense of piousness. It is justified by recognizing what you’re doing and then apologizing for it. Well, I don’t pretend to have SCIENTIFIC and SOCIOLOGICAL evidence of every assertion I write on this blog. I am not trying to write a peer review paper. I based this post first of all on my personal experience and that of numerous other people I’ve interacted with: when confronted with belligerent atheists, the large majority proved to come from religious conservative families. I backed this up with the article, given that there is a huge overlap between bullying Professional Skeptics and the New Atheists. 1) I don’t buy the idea we can only assert things we know to be scientifically (or scholarly) evidenced: it is impossible to live in this way, most of our opinions don’t fall within that category. If I observe something repeatedly, talk with other persons (both believers and non-believers) who confirms that observation, I’m considering it as likely true UNTIL someone disproves this empirically. At least, it seems to be pretty much the case in the US. “religious liberals support fundies” and so on and so forth…. grounded on rigorous scholarly studies ? Remember that you are always speaking about ALL religious movements and people, which makes them much stronger claims to defend. I have provided you with compelling evidence – a long list of the most popular and best selling New Atheists who criticize religious privilege and have never had the kind of negative fundamentalist/religious experiences you deem as a the necessary motivation for their anti-theism. (I claim that all religious belief must be ‘fundamentalist’ at some point of basic tenets no matter how liberal the belief may be in practice.) But you ignore this evidence and carry on with your factually incorrect assumptions about New Atheism and those who constitute its ranks. Claims of causal effect attributed to interventionist divine agencies are without any knowledge merit whatsoever, yet these claims are made all the time by the religious, demonstrating the such folk pretend to know stuff they know nothing about (or they would show us this causal effect with a demonstrable linking mechanism that, so far, as yet to be produced. Ever.) And based on these knowledge assumptions and assertions empty of demonstrable evidence in their favour, we find privilege accorded to such beliefs in the public domain. This is not just intolerable to any mind armed by critical reasoning and in favour of enlightenment values of individual autonomy and rights but offers succor to attempts to rectify this travesty wherever we find it: in law, education, public policy, healthcare, defense, governance, research, and so on. You will dismiss all compelling evidence of demonstrable harm caused by such religiously justified impositions as not reflective of your religious beliefs or ‘improper’ religious expressions. The world is not just chalk full of such religiously-supported harm but all around you every day in the form of assumptions and assertions that religious affiliation is magically good and proper and moral because it is religious – a beautifully circular piece of rationalization – without seeing the social misogyny and bigotry and human cost in the loss of personal autonomy and legal equality it empowers in action. Sure, you want the LBGT crowd to have equality rights. What you don’t see – or wish to consider – is the very long – and ongoing – battle against the religious indoctrination that empowers it. Only by reducing the grip of religious justification for the denial of equality rights has this civil right finally made it into secular law… in some places. And the harm to real people in real life has been – and shall continue to be – immense. Nothing religion produces can justify this natural byproduct of religion: intentional harm. And before you consider the ‘good works’ of various religious institutions, ask yourself if the same work depends on the religious component or if its positive effects has been co-opted by the religious component to promote itself vicariously (Hitchens’ challenge). Even if you might be right on some points (and as a progressive Christian we certainly have some common ground) your aggressive tone made me utterly unwilling to engage any conversation with you. Maybe some of my commentators will, but I don’t have the nerves for this. My aggressive tone in a response to you calling me a bigot and misrepresenting my character because of my admitted affiliation with New Atheism that in your mind equates me with a far right militant group out to eradicate the religious. This claim you make is in error and I’ve demonstrated why it is in error. I sincerely don;t think it’s my tone that bothers you to the extent that you wish not to respond to my charge of exercising bigotry against New Atheists, lotharson; it’s that I honestly think you can’t respond with compelling evidence to back up your claim. That’s why I continue to think you can’t refute my charge that you intentionally misrepresent, distort, and lie to malign my character-by-affiliation. As far as I can tell, you make these claims willingly and knowingly that they are not true. I suspect behind the hand-waving is the brute fact that you just don’t want anyone to confront you about it. I’ve made it a policy NOT to respond if a healthy dose of respect is conspicuously absent. And I am FAR from being the only Christian who thinks you’ve a bullying behavior. As far as I’m concerned, you’re entirely free to think I’m a fool, idiot, deceiver, moron..I couldn’t care less. But let me finish with one positive thing: I am largely sympathetic to respectful atheists who combat religious and non-religious extremism and sincerely seek to improve the world, actually I feel myself much CLOSER to them than to many Conservative religious believers. I hope that one day, you’ll become such an atheist and leave anti-theism behind. Well, answer me this, Marc: why should I strive to shape my tone to your satisfaction when you intentionally and without any consideration for me as a person malign my character for no other reason than because I identify with a group of people who place more importance on human welfare than the welfare of religious sensibilities? You call me a bigot for nothing I have ever said or done… other than you believe the group identity (that you improperly define) is bigoted. I have gone out of my way to demonstrate that your definition is without any merit and yet you persist on maligning my character based on it. When I tell you that your definition distorts what’s true and misrepresents those who popularly is the public face of this group, you wave the criticism away without addressing it. That’s rude. When I ask for evidence, you claim the way I ask is simply too rude for you to have to deal with. That’s hypocrisy, Marc. What you demonstrate is that you can dish it, but when called on it, you take on the victim role. That’s cowardly. Your response to all my approaches is a diversion, a stalling tactic, a way to avoid having to take responsibility for your opinion. You can’t call me a bigot and then reasonably expect me to roll over and pretend that my criticism can be ignored because it is somehow harsher than your insult. It’s not. What informs your opinion I think is an unreasonable fear that New Atheists are having great effect that will produce negative consequences. (I think those consequences are positive.) I think this fear excuses you to malign me. To defend this tactic I think it is rather obvious that you use a compilation of the worst possible rationalizations. My tone has nothing to do with it. You should stop make unwarranted assumptions and stick to the facts. I have had several nice atheistic commentators on this blog, and if one of them had challenged me, I shall surely have answered him. But I see no reason whatsoever to further pursue the disagreeable conversation we’re having. One question to ponder upon: how many religious believers could you deconvert by using such a tone? Would it not be more productive to become friendlier and try to engage in a true conversation instead of a battle? And first of all, consider my own definitions of the terms: I am NOT speaking about atheists in general but about anti-theists (New Atheists) who think that religion ought to disappear and that bullying religious believers is okay or even great. I have NOTHING AT ALL against respectful atheists fighting for the separation between Church and State while tolerating religious communities having no harmful effects on society. And frankly speaking, your incredibly rude tone makes me and any other religious believer extremely unwilling to interact with you. What about first trying to understand what your opponents really think and why they think that way before trying to shoot them down? Lotharson, you continue to insist I am a bigot (I’m not) because I’m a New Atheist, which you continue to define as militantly anti-theist rather than what it is: atheists who publicly criticize religious privilege in the public domain. When I point out why your insistence is factually wrong and to therefore please stop spreading this lie – for that is what it is – you call me incredibly rude. Well pardon me for speaking out against your your discrimination, your disinformation, and your continued character maligning for reasons that are demonstrably false. I am not now and never have been religious. I carry no deep scars of a childhood religious indoctrination. By far, the number of people who identify as New Atheists and criticize religious privilege in the public domain share a similar history – people such as Dawkins, Dennett, Harris, and Hitchens as well as a long list of other very popular New Atheists whose writings are widely read. Some New Atheists are, in fact, de-converted religious fundamentalists but that isn’t the point; the point is that this is not the reason for New Atheism. Your insistence that they are motivated as you define them to be rather than as they really are motivated is not a very good reason for holding this group in such contempt as you do, and continue to call them militant and bigots and anti-theists out to eradicate religion from the face of the earth when all they are doing in fact is criticizing religious privilege in the public domain and having the gumption to explain in clear language informed by compelling reasons why this removal of privilege is worth pursuing. Sure, convincing people to stop empowering faith-based belief would be welcomed but this is seen as a process best achieved by reason used efficaciously against poor reasoning and not violence as such words as ‘militant’ suggests. Your reasoning is very poor for your opinions about New Atheists and their motivations and your source material for its conclusion is a non sequitur. I’ve explained this. But rather than revamp your conclusion to align with reality, you continue to rationalize your contempt and name-calling against real people because they are New Atheists. This is a Crude-ism in action and requires misrepresentation, misinformation, and contempt forged from bigotry. You’re better than this… or I wouldn’t bother. You are capable of aligning your opinions with reality yet choose to vilify real people based on their association with a group identity. This really is, by definition, bigoted. Anti-theism is aimed at countering theism and we are allowed to vilify bad ideas if our evidence reveals cause. I think religious belief offers us such cause. Notice I’m not vilifying you because your a theist; I am pointing out that you are trying to spread false ideas as if they were true and this meets the definition of lying because I’ve pointed out why and how your ideas are false and that you are aware that they are false when cast over this large group of people… some of whom are no doubt anti-theist, I’ll grant you. But I don’t condemn your character for the actions of religious individuals; I condemn your religious affiliation with them and applaud you for breaking free in some matters… like legally accepting homosexuals as fully autonomous individuals rather than allow religious bigotry to be empowered. Hmmm Marc – yeah I’m not sure there is necessarily a causal link between ex fundies and militant atheists (credit where credit is due tildeb old sparer). I think culture wars in America has spawned militancy definitely – but this has complex causes. One of the reasons why Richard Dawkins doesn’t go down big with atheists in the UK – he has a following but many atheists here are critics of him – is that he’s in the culture war planet America mind set. Seven day creationism is not big a the moment in the UK even among Conservative Evangelicals for example. Ironically one of the factors that goes against religious extremism in the UK is that it has an established Church that has always been a mediator between different religious groups and between the Church and the secular world rather than having a sectarian bias. In America – where Church and State are separate religious individualism apart from the social world grows apace and could threaten the Jeffersonian liberal polity. And of course the growth in home schooling means that religious kids and secular kids don’t have to mix – don’t have to negotiate reality together (I’m not against home schooling – just saying that it could have unforeseen consequences that need to be thought carefully about). Funny old world. American individualism has its strengths but also has its weaknesses IMHO. Which kind of death would you prefer? If I told to UKIP members that (culturally and historically) British folks ARE Europeans, they would throw me into the ocean and let my lifeless body drift around between Dover, France and Belgium. I definitely believe it is good for a worldview-neutral state to have a moderate and strongly entrenched Church on its territory, such as the Church of England.